On January 11, supporters of the Equal Employment Ordinance encountered a major obstacle when State Sen. Beau McCoy introduced LB 912, which would have left any employment discrimination policy decision up to the state and not individual cities and counties. 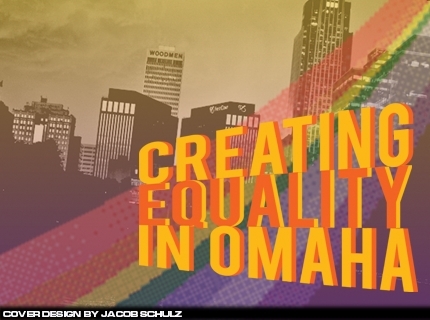 If passed, LB 912 would have made any attempt by Omaha to pass an equal employment initiative a moot point. At the time of McCoy's introduction, Gordon said the strategies set forth to support Gray's ordinance had to shift gears and move to counter McCoy's legislation. "Right now the barn's on fire," Gordon said of the mindset when McCoy's legislation was announced. "Right now, we've got other things to do... mainly kill that bill." Omaha musicians mobilized against McCoy’s measure. Conor Oberst, members of The Faint, as well as members of Conduits, The Good Life, McCarthy Trenching, and Laura Burhenn of The Mynabirds, also an active member of Equal Omaha, signed a letter urging Nebraska senators to vote against LB 912. The public hearing on LB 912 was held in February. The bill later languished in the Judiciary committee where it was "indefinitely postponed,” according to the Unicameral's website. Gordon pointed out that had McCoy's bill passed, two classes currently protected by Omaha's bylaws are not included in the state's non-discrimination policy -- age and martial status. As a result, it would still be legal to discriminate by either age or marital status under McCoy’s measure, Gordon said. "Do you really want to set the clock of discrimination back 20 years to tell old people they can be kicked out of their home?" Gordon asked. "That's when we knew it was dead in the water." Read the entire article at the Reader or pick up a copy at locations throughout the city. Below: the far-right Alliance Defense Fund supporting Sen. Beau McCoy's effort to kill equal employment for gay people throughout Nebraska. Former Peter Kiewit executive Bill Grewcock and his wife, Berniece, have contributed hundreds of thousands of dollars to the ADF. Above is incontrovertible video evidence shot by AKSARBENT last Friday of how badly you can dance and still get on the stadium screen at TD Ameritrade Park. If the boys pictured, who seem to be local (judging by the T-Shirts), are any indication, then Omaha has literally gone downhill. It was, after all, much higher up on 10th Street than TD Ameritrade Park where baby Fred Austerlitz (Astaire) was born on May 10th, 1899, a few blocks from the future Rosenblatt stadium that will be demolished next month, and more than a century away from the regrettable devolution of Omahans' ability to dance well enough in public to avoid public ridicule in misanthropic blogs like the one you're now reading. Below: even lead-footed Bruce Springsteen proves he can boogie down (albeit with some help) better than the unnecessarily encouraged chuckleheads above. Larry Ellison, CEO of database software behemoth Oracle and the third-richest man on earth, has bought 98% of the Hawaiian island of Lanai for $500 million from Castle & Cooke, whose owner David Murdock is also the majority owner in the Dole Food Company, founded in Hawaii in 1851. Murdock, 89, worth an estimated $2.5 billion, will retain a solar farm and Lenai population has dwindled to about 1,900 people since the last census and is about 140 square miles or 88,000 acres. Ellison's buy includes two luxury resorts, two golf courses and two club houses. The island has been losing tens of millions of dollars per year. Photos: ALYSSA SCHUKAR/THE WORLD-HERALD. Buy them here. Their dugout is nowhere you'd want to visit. Their mascot is a betta fish who travels with them in a tupperware container and has his own twitter hashtag, #fearthefish. They're the South Carolina Gamecocks, and they're quite eccentric. The World-Herald reports that more than 9,500 people have made a pilgrimage in the last five days to the former site of the College World Series, dearly beloved Rosenblatt stadium, which will be demolished next month. Every College World Series game from 1950-2010 was played there, in a friendly residential neighborhood before the venue moved uptown to glitzy TD Ameritrade Park. The W-H said fans carted home dirt in every kind of receptacle possible. Even Mr. Bull Durham/Field of Dreams himself couldn't save the 'Blatt.